One of my aunts was over to visit recently and gave me a couple of old family photographs. This was taken on the back step of the home I grew up in in Kamloops. My grandfather and grandmother, along with two aunties and an uncle, stand behind my sister, my brother, and me. I'm flapping my hand - probably bossing someone around. As the eldest, I felt that was my responsibility, and according to my siblings, I did it well. This must have been taken after church because look at the way we're dressed! Bowties for the gentlemen big and small, patent leather shoes and white socks for the little girls. My mother sewed for herself, and for my sister and me - beautiful dresses always. I've looked at this photo many times over the past month since I've had it and what puzzles me is having no recollection of the event. None. I recognize myself but that's all. Yet, according to neuroscientists, this event is stored somewhere in my brain, I'm just lacking the retrieval system to access it. Perhaps it's blurred together with all the memories I have of childhood, which was a happy one, for the grand part. I can imagine my parents standing behind the camera, admiring their offspring, just as I have done in similar situations. Although I don't remember the day of this photo, I do remember having fun with my grandparents and aunties and uncle (just one on my mother's side - but that's another story). I'm thankful for my childhood, for the family I was given, for love and security. It's a wonderfully sweet photo. Your sister's and brother's grins are so genuine. They are truly "in the moment." I have no recollection of being there either, Lorrie, but I'm pretty sure that I recognize myself there in the back to the right. LOL! As long as you remember the love, you're doing very well. Sweet picture, Lorrie. Thanks for sharing this .. . warms the cockles of this family history buff's heart. I've just read backwards through several of your recent posts - lots of love and reflection and kindness. Thank you for sharing. 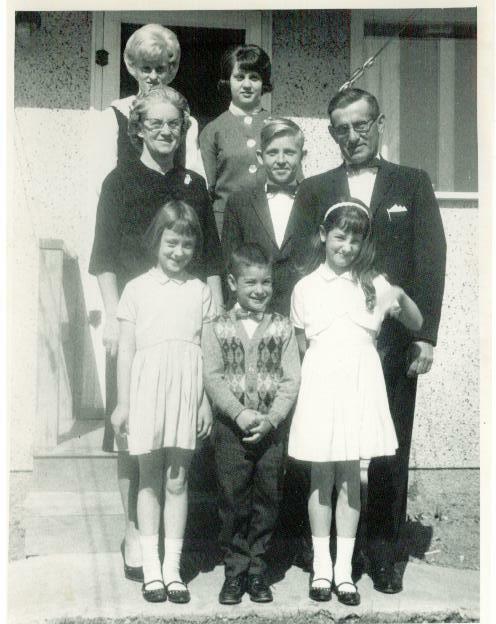 Old famly photos such as this one keep us connected and in touch with who we are. Wow...I recognize Auntie Darlene so easily! What a neat photo! Fun to see the photo with you as a young child.